Clearings and borders of coniferous or deciduous forests. This is an eastern species, at the western edge of its range in Michigan near the shores of lakes Erie and Huron. Collections from Oakland, Leelanau, and Marquette Cos. surely represent escapes from cultivation. 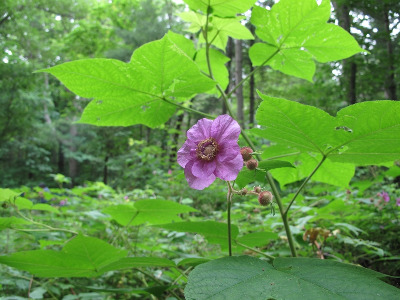 In R. odoratus, the fresh young branches and peduncles are very sticky with clammy purple pubescence and the lobes of the leaves tend to be more acuminate at the tip. In R. parviflorus, the branches and peduncles are not so sticky and the leaf lobes not so acuminate. The best discrimination seems to be made on the calyx lobes (not necessarily the broad tube), which in R. parviflorus are sparsely to densely covered with glands sessile or nearly so or on stalks at most ca. 5 times as long as the glands; these are generally yellow to orange, occasionally with a suggestion of purple. The much longer-stalked glands on the calyx lobes of R. odoratus are dense and rich purple, as also on the peduncles and new growth. White-flowered plants rarely occur (f. albiflorus House) and are superficially confused with R. parviflorus; however, all white-flowered plants found in Michigan occur in the only region where the ranges of the two species overlap in Presque Isle and adjacent Alpena Cos. (particularly Thunder Bay Island). Here, the species are evidently hybridizing to produce R. ×fraseri Rehder. Suspected of being this hybrid in the wild are plants with pale or partly pink flowers and less glandularity than usual for R. odoratus, as well as those with white flowers but more glandularity than usual for R. parviflorus. MICHIGAN FLORA ONLINE. A. A. Reznicek, E. G. Voss, & B. S. Walters. February 2011. University of Michigan. Web. 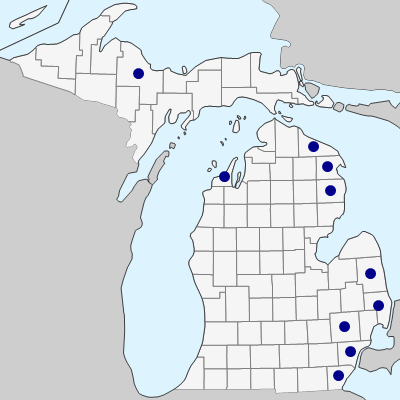 April 21, 2019. https://michiganflora.net/species.aspx?id=2560.